A CSO/Wet Weather Discharge Point on the West coast of the Bronx River near Tremont Avenue. Climate change is leading to more intense rainstorms and as a result there’s a peak load problem. The NYC Panel on Climate Change expects up to an 11 percent increase in precipitation by the 2050s. This excess amount of water is predicted to stress the city’s sewer system even further, causing wastewater that is normally treated by treatment plants to flow into nearby rivers and wetlands. 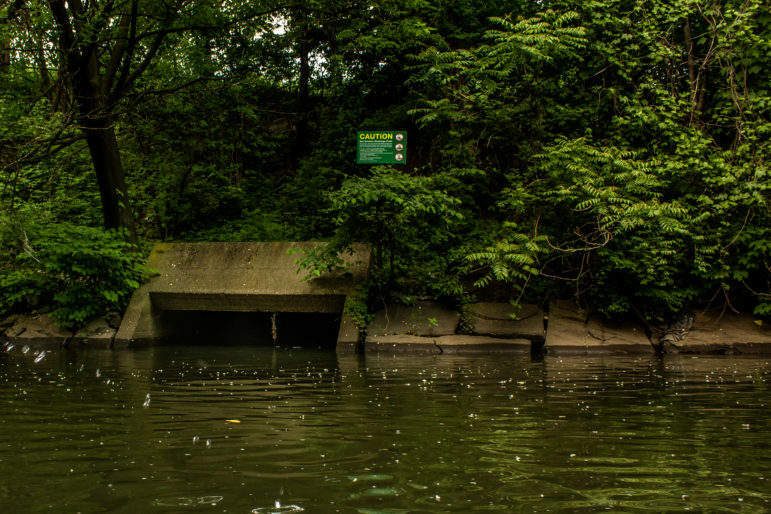 Under a 2012 Consent Order, the city committed to spend a total of $4.2 billion to mitigate combined sewer overflows. It promised to invest in improvements like wastewater treatment plant upgrades, storage tanks and sewer separation as well as allot $1.5 billion to green infrastructure projects like rain gardens and green roofs. The city’s green infrastructure addresses 90 percent of rain events for the year but it’s not designed for very large storms, said DEP Managing Director of the Office of Ecosystem Services, Green Infrastructure and Research, John McLaughlin. “It’s all very storm-specific,” he said, if it rains three inches in four hours, the rain gardens and green roofs probably won’t be able to handle that volume of water but they probably can take on three inches over the course of a day. If the rainfall is spaced out enough and the subsurface infiltration is great enough, green infrastructure is equipped to handle stormwater catchment, he explained. Some still think the city could be a lot more ambitious about how they’re reducing CSOs. Korin Tangtrakul, a Soil and Water Conservation Stormwater Technician with New York SWIM Coalition, believes having a more robust and effective green infrastructure plan will help reduce the overflow. “To think that sewage is causing more greenhouse gas emissions in wetlands—it’s a pretty terrifying prospect,” she said. As the city’s population increases, the amount of sanitary waste pouring into the system also skyrockets, potentially adding to the greenhouse gas emissions. According to the Mayor’s Office of Climate Policy and Programs, the city is leading in the fight against climate change with a commitment to reduce these emissions 80 percent by 2050. But Dr. Greg O’Mullan believes the problem is a lack of understanding of how CSOs and greenhouse gas emissions relate to one another. An environmental microbiologist who worked on the study with Brigham, O’Mullan has been studying bacteria indicators in the city’s surrounding waterways for the past 15 years. “The CSOs are a design feature that has very negative consequences,” said O’Mullan. When city planners discuss CSOs, he said they should look beyond just the health factors like reducing pathogens and infection risk. “We don’t account for what’s released into the environment and turned into greenhouse gases,” he said, because carbon can be delivered in one form but there are alterations that happen in the environment, which turn it into carbon dioxide and methane. But Tangtrakul said the study’s findings further demonstrate the need to take action to reduce combined sewer overflows. New Yorkers should start conserving water during rainstorms to help reduce the amount of sewage contributing to a CSO, she said. That means waiting to do laundry or dishes until after the storm passes, she said. Most of the east shore of S.I. is already connected to the Bluebelt stormwater management system. Great coverage on an important subject; thanks! Great idea! In Forest Hills, the advent of McMansions in the Cord Meyer district has meant an increase in flooding downhill to the “valley” on Yellowstone Blvd. Aside from being an eyesore, those homes are definitely affecting the environment by destroying the natural greenery that previously abated some of these issues. $28M Bluebelt, sewer project underway to reduce flooding in Travis. -Rain gardens, green roofs, permeable paving, man made wetlands. Anyplace you can open up the pavement to plant something you can reduce the amount of runoff. As community groups oppose the city’s moves on an East Side resiliency project, the region awaits the Army Corps of Engineers’ proposal for harbor storm barriers.